Educating high school students in Germany appears to be highly effective through cartoons. In their study about India, the text books and CD-ROMs now have included Indian cartoons by Manick Sorcar. Two of the renowned publishers, both based in Germany, took permission to reproduce cartoons from Sorcar’s popular two cartoon books, “The Melting Pot: Indians in America”, and “Spices in the Melting Pot”. 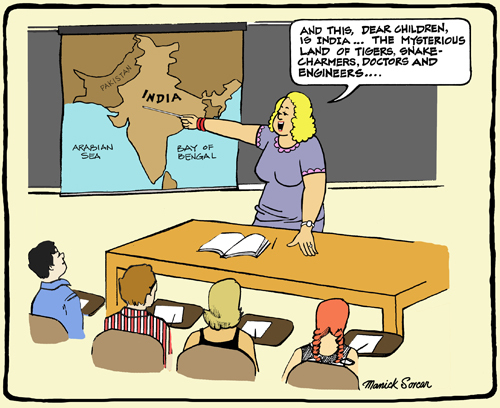 A cartoon from Manick Sorcar's "The Melting Pot: Indians in America"
In the cartoon, a teacher pointing at the map says, “And this, dear children, is India, the mysterious land of tigers, snake charmers, doctors and engineers”. Another request for reproduction of Manick Sorcar’s cartoon was for a CD-ROM to be used in high school class rooms. “We are schoolbook publishers of English language teaching material for the German speaking market”, wrote Dr. Beatrix Finke of Langenscheidt ELT GmbH, Mies-van-der-Rohe-StraBe (publishing company) while seeking the permission, “In one of our forthcoming titles (‘View Finder: India’, CD-ROM) we would like to reproduce your cartoon subtitled ‘C’mon Mom’. The authors are Dr. Mita Banerjee and Susanne Stadler”. The CD-ROM contains other cartoonists’ work on India’s independence movement and political unrest due to threats from neighboring countries. Sorcar’s cartoon “C’mon Mom” was used to focus on the impact of Bollywood films on daily life of the Indians. It was reproduced from Sorcar’s second cartoon book “Spices in the Melting Pot”. 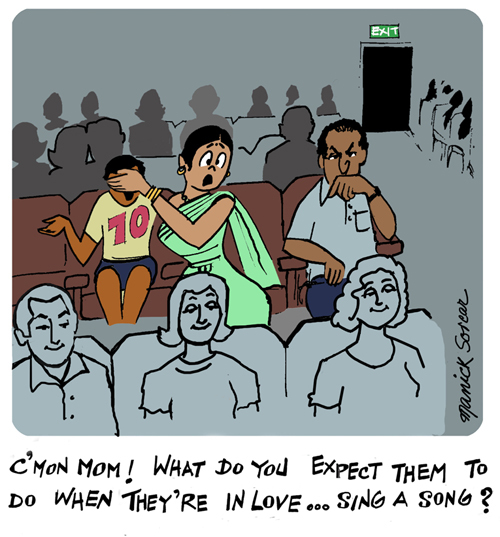 A cartoon from Manick Sorcar's "Spices in the Melting Pot"
“In Bollywood films songs play an important role. The protagonists sing (playback) and dance to intricate choreographies. As a matter of fact songs do replace eroticism in a way. -What does the boy’s reaction (and his looks) reveal about his attitude towards the movie? -Where is the cartoon set and what is the situation? -Compare looks and facial expressions of the woman in the front row with “Mom’s” and explain her reaction. The CD-ROM has been published and is in full use in classrooms at present. The book awaits release in July, 2010.